Notes: Grinsell WIDECOMBE 4. Butler Volume 1 Map 20.12. The earthwork remains of two Bronze Age cairns. 'B' is a cairn 42 feet in diameter and 3 feet high. Cairn with small hollow towards centre. 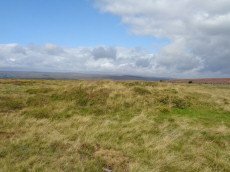 Notes: Grinsell WIDECOMBE 5. Butler Volume 1 Map 20.12. ['A' SX 7073 7904]. Tumuli on saddle, 'A' is 40 feet in diameter with a rim 1 ft. high. One of pair of cairns, this one is concave or "saucer" shaped. Notes: Dixon #60. Bar Rep. 54. Butler Hamel Down 15 (S) - Vol. 1. Map 20.15 (Cairn 15 p.149, diagram Vol 5. p.178). Grinsell WIDECOMBE 7. Precise location originally unsurveyed but given approximately by Worth as SX 71257908. This may explain the large discrepancy between the NMR position and that given by Butler and in the HER. 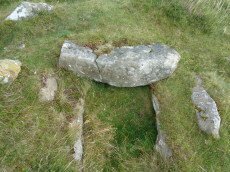 Three sides of the cist are visible with the fourth having sunken below the earth. The capstone is incomplete and only partly covers the cavity. Lethbridge diagram p129 and photo top p.129. 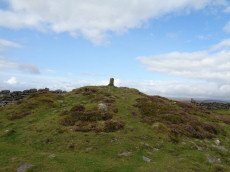 Notes: Grinsell WIDECOMBE 6. Butler Volume 1 Map 20.13 A grass covered cairn which was alleged to have been used as a beacon in medieval period.